Hip dysplasia is one of the most common pediatric orthopaedic conditions affecting children from newborn age, during childhood with effect even during adulthood and old age. Hip dysplasia is a delay of development of the hip joint. The pelvic part of the hip joint is too small, to steep or not developed anatomically correct. As a result the cavity of the hip joint does not or only minor stabilize the upper part of the femur bone and its articulating part of the femoral head. 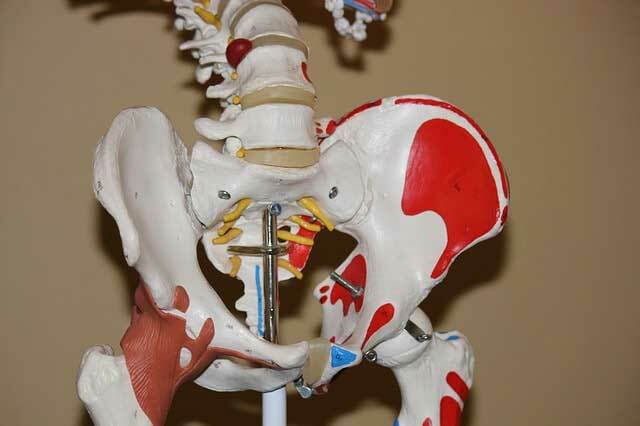 There are multiple degrees of delay of hip development known, from milde dysplasias to complete dislocations, unilateral or with both the hip joints involved. Is there a difference in hip dysplasia and hip dislocation? 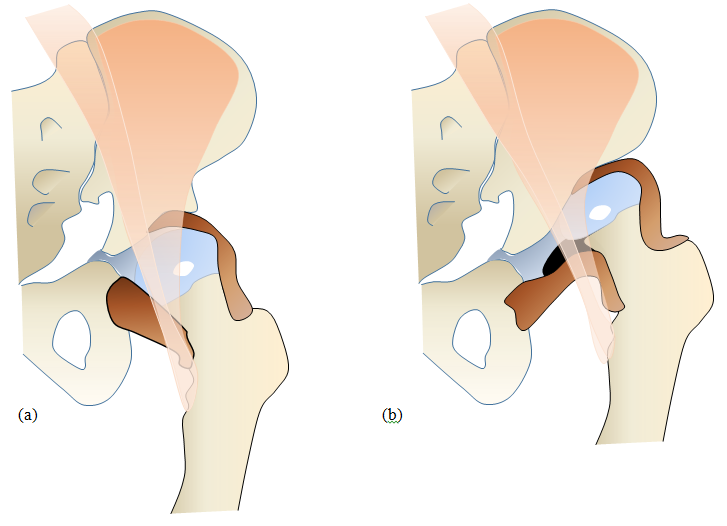 A dysplastic hip can be either centered (a) or displaced/ dislocated (b). In a centered hip the upper part of the femur with its femoral head is still centered somehow within the hip joint fossa acetabuli. 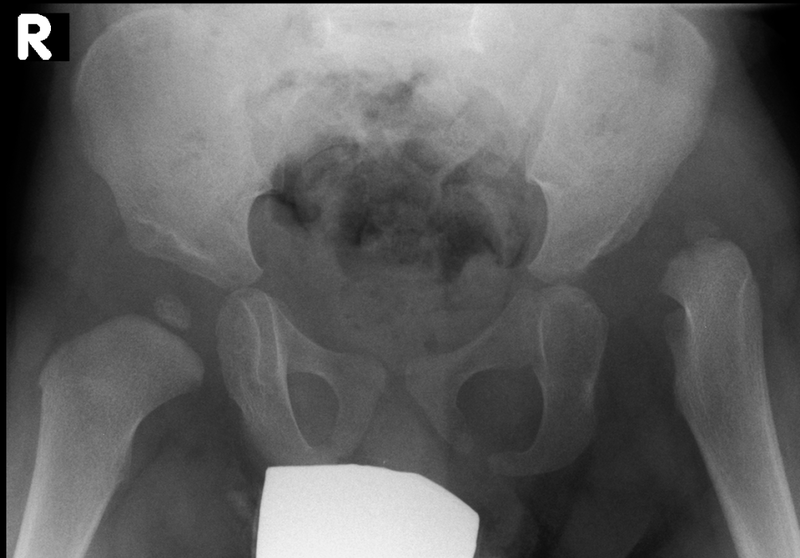 In case of a hip dislocation the femoral head has already slipped out of the acetabulum. As a consequence there is an independent development in between these two normally perfectly fitting joint parts with resulting incongruity. A dislocated hip is not able to properly stabilize the joint while walking, hip imbalance with limp will develop. What is the reason for a child developing hip dysplasia? The exact cause for the development of DDH is still not exactly known. However it is widely believed that hip dysplasia is developmental. This is because hip dysplasia is known to develop around the time of birth, after birth, or even during childhood. Therefore is also why hip dysplasia is often defined as “developmental dysplasia of the hip” (DDH). Are there risk factors for a hip dysplasia? General risk factors are for example twin pregnancies, oligohydramnion (low intrauterine amniotic fluid level), breech position, female gender, firstborn and a family history of DDH (Developmental Dysplasia of the Hip). In these cases the incidence of developing a DDH is significantly higher. Specific positioning of babies e.g. squaddeling after birth is known to have negative effect to the hip development. What are the symptoms of a hip dysplasia in a newborn? 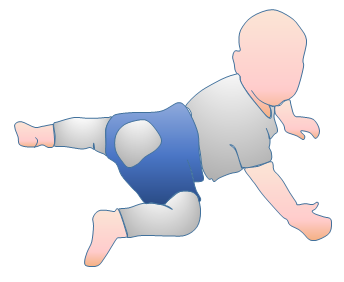 Clinical symptoms which can be seen in newborn are a limitation of abduction possibility of the affected hip joint or leg. Sometimes a fold asymmetry in the upper leg, at the gluteal fold or the labial fold can be seen, especially if one hip is instable and has the tendency to dislocate, then also a leg length discrepancy might occur. 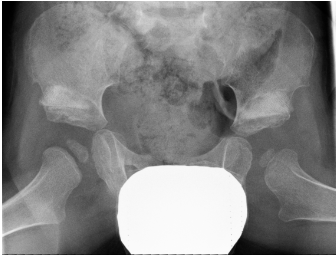 The experienced examiner might find signs of hip instability (Ortholani, Barlow) during the examination. Older children might develop gait asymmetries or a limp, rotation anomalies of the legs or tiptoe walking. Mild to moderate hip dysplasia very often cannot be identified by normal clinical examination alone. This needs further on examination. Therefore the golden standard of diagnosis is meanwhile the ultrasound examination within the first months of life of a newborn. 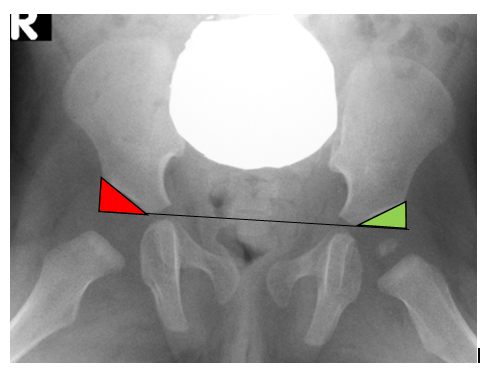 It is generally recommended to have at least one valid picture of the hip to visualize and measure the hip anatomy. This can be done easily and without the need for radiation with ultrasound in a newborn. Ultrasound is the golden standard of examination to evaluate if a child is affected by a hip dysplasia. Ultrasound is pain free and does not contain any kind of radiation. Pregnant woman know ultrasound as a pain free possibility to see their children and its heartbeat already in the uterus even before the baby is born. This ultrasound technique allows as soon as the child is born to see the developmental status of the hip joints. The ultrasound examination can be done from the date of birth until the osseous growth centre of the femoral head has developed and hinders the ultrasound beam to approach the deep fossa of the hip joint. This usually happens at the age of about 5 to 6 months in healthy mature babies. Can any examiner do a hip ultrasound screening? The ultrasound hip screening can be done by a special trained pediatric doctor or pediatric orthopaedic doctor. 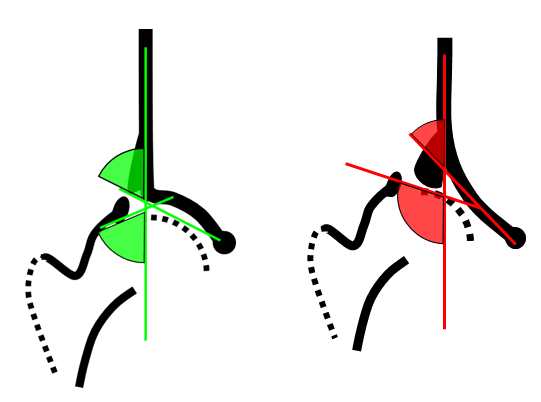 The standard Ultrasound method for DDH (Developmental Dysplasia of the Hip) is the Graf Method. With this method a hip dysplasia can be diagnosed reliable. Usually a special positioning mattress is used to be sure that standardized examination circumstances are given. A specific ultrasound device with angulation measurement and linear ultrasound probe will allow correct measurement of the hip anatomy. What is the Graf Method of Ultrasound? Reinhard Graf is an Austrian Pediatric orthopaedic surgeon, he has been Head of the Stolzalpe Hospital/Austria from 1988 to 2011. Here he developed the Ultrasound hip examination already in the 1970s in Austria.. As a general hip screening method to diagnose hip problems it has been established in Austria in 1992 as a mandatory hip screening for newborn. Germany followed in 1996, Switzerland in 1997. Since the screening is established the problem of hip dysplasia in these populations is almost completely disappeared, as treated early, the prognosis is excellent. Since the screening has been established the amount of hip surgeries in these countries is reduced approximately by 50%. Are there any other methods of diagnosing a hip dysplasia? In older children where the bone growth development is already more developed the standard examination for hip dysplasia is the x-ray. This will usually be done with special x-ray filters for children and gonad protection to reduce radiation to a minimum. What happens if your child is diagnosed with hip dysplasia? If your child has a hip dysplasia, treatment options will be discussed with the pediatric orthopaedic surgeon. The treatment depends on the age of the child and severety of the dysplasia. In a vast majority of the cases conservative therapy can be done if the diagnosis is confirmed early. 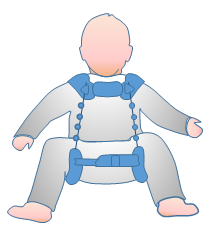 Then certain splints and braces will be worn by the baby for a period of time until the hip development has become physiologic. Usually these splints and braces are applied in a certain hip flexion abduction position which allows the hip to develop regular. 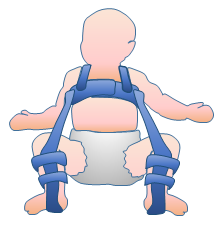 What kind of splints or braces are usually used for hip dysplasia treatment? How do I know how to apply the splint or brace? The treating doctor will explain detailed about the splint treatment. Parents will be instructed if the harness or splint can be removed for bathing and pampering or if the splint might be needed full time. The splints and braces will have to be adjusted time by time to the growth of the child. In certain intervals follow up examinations have to be done, either with ultrasound, when the children are becoming older also with x rays. Is it easy to treat a child with a hip dysplasia? Generally the outcome of a therapy is much better the earlier the diagnosis is confirmed. The later a hip dysplasia is detected the longer a treatment might be needed. As an important part of the treatment is usually done as an outpatient treatment the patient compliance is an integral part of the treatment. Therefore the doctor will exactly explain the treatment steps and requirements to the parents. What if my child need a surgery? In severe cases surgical options might have to be discussed. The pediatric orthopedic surgeon will then explain the necessary steps of treatment detailed with the parents and the family. Which kind of surgical procedures might have to be done? In case a treatment is not successful with conservative treatment or the hip situation is not allowing a stable reduction of the hip surgical options might be needed. With closed or open reductions of the hips it is possible to relocate instable hips to a physiologic hip position. This position usually needs to be held stable with a special hip spica cast for a period of 6 weeks to 3 months to allow the joint to grow stable around the repositioned femoral head. During the casting period the childs needs special hygiene care in which families are instructed. In case a cast needs to be applied for a period of 3 months a cast change after 6 weeks is done. Usually these treatments will be done under general anaesthesia during a short in-patient treatment at the hospital. In cases where the bony acetabular roof is not developed properly from at an age from 15 months to 8 years a reconstruction of the acetabulum with an acetabuloplasty is usually performed. Therefore a bone graft will be applied in the acetabulum bone to create sufficient acetabular coverage to protect the hip from dislocation. Sometimes in older children this needs to be combined with an adaption of the upper part of the femur bone to allow the femoral head to stay centered in the joint. 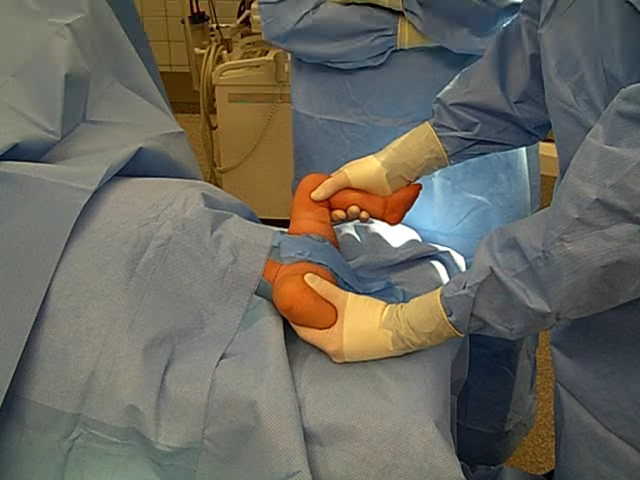 Several other techniques of hip reconstruction are published and can be performed related to the pathologic findings of the child. In case the treating pediatric orthopedic surgeon will discuss the treatment option in detail with the parents. Is there any possibility to protect the hip of a newborn? During the first month of life the babies hips have a normal flexion tone. This flexion tone should be initially protected. Extension of the hips e.g. with squaddeling should be avoided. Specific baby slings and papoose are on the market, which support the knees of the baby and protect the babies hips during carrying time. Vitamin D3 Prophylaxis allows sufficient bone metabolism and reduces the probability of ossification delay. How long is the follow up period in DDH after it is healed? The follow up needs to be done until maturity. During the growth period there is always possibility for developing secondary dysplasia of the hips which should be ruled out during growth within certain intervals. Your treating pediatric orthopedic surgeon will guide you regarding these intervals. Usually these are done at the age of 3 years, 5-6years, in puberty and after end of growth.